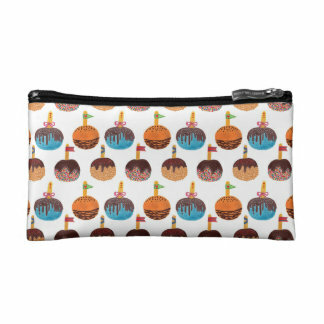 Portfolio site of Haidi Shabrina, illustrator and pattern designer specialize at watercolor illustration applied onto merchandise, such as iPhone and iPad cases/skin, throw pillows, t-shirt, tote bags, rugs, art prints, wall clocks, shower curtains, duvet covers, note book, and more. 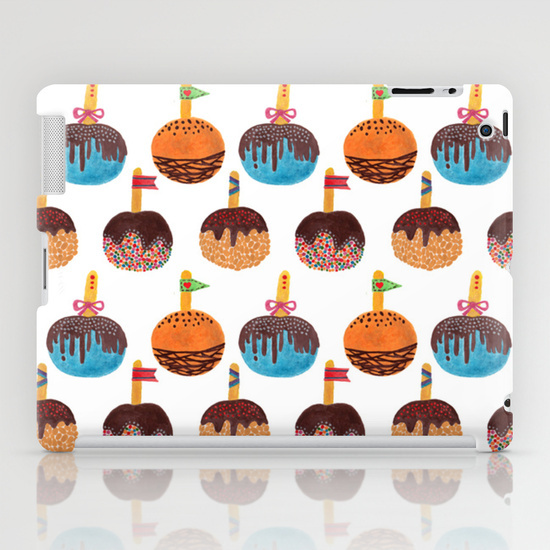 Candy Apple, fruit, pattern. This pattern is done with watercolor. Suitable for girl and children. 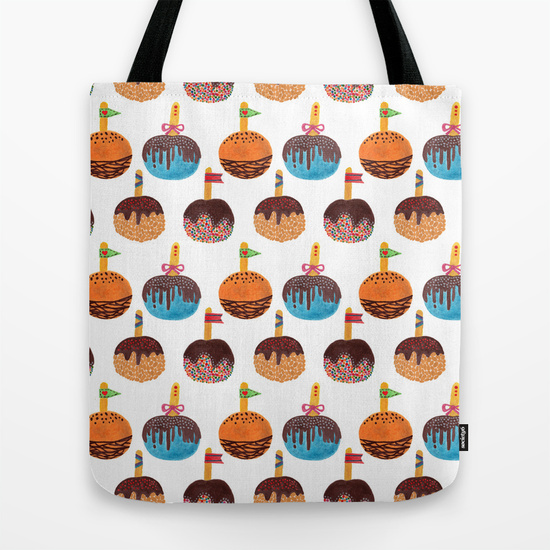 It would be nice if you send me your photo with the product that my illustration on it. If you have any questions or requests, please let me know. Follow my instagram @haidishabrina to get the latest offer. 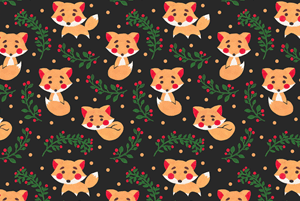 The fox pattern made with 100% watercolor hand painting. Inspired by fox animal in wildlife. 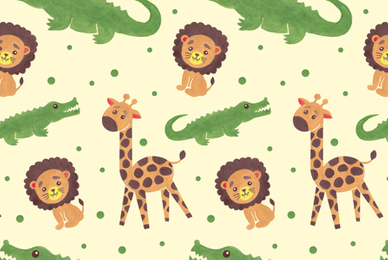 This pattern is suitable design especially for kids. 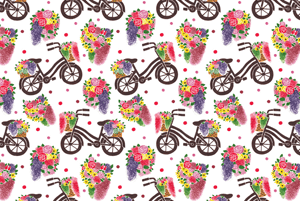 The vintage flowers bike pattern inspired by classical flower delivery by bike. Represent warm and happiness in spring season. 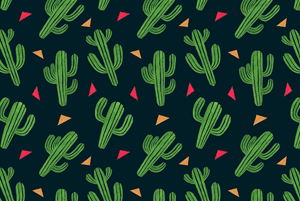 Cactus Fiesta Pattern inspired by cactus plant with simple triangle decoration and dark background. The illustration painted with watercolor. 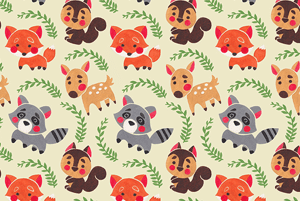 The Happy Forest Friend Pattern inspired by cute forest animals in autumn season . 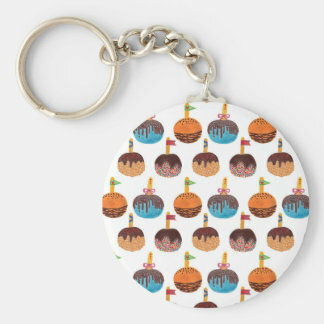 The color choice represent warmth and happiness. Protea is flowering plant from South Africa which also known as sugarbushes or suikerbos in Afrikaans. 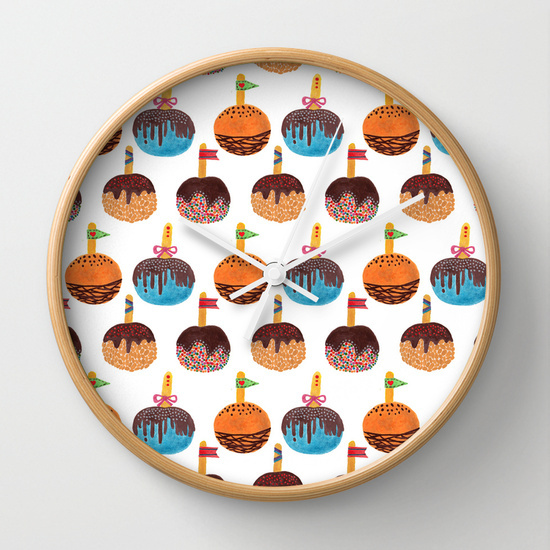 Suitable design for representing summer time. 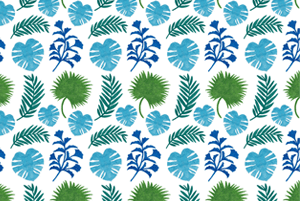 The Palm Leaves Pattern inspired by kinds of tropical palm leaves. The colors choice inspired by tropical caribbean colors. The illustration painted with watercolor. 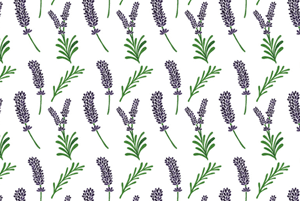 Lavender is plant which find in Cape Verde and the Canary Islands, southern Europe across to northern and eastern Africa, the Mediterranean, southwest Asia to southeast India. 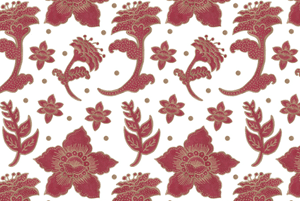 The Burgundy Batik Flowers inspired by traditional motif of flora in Indonesian Batik pattern. 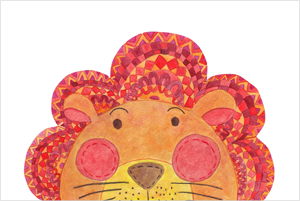 The illustration was painted with watercolor and finished with golden marker. 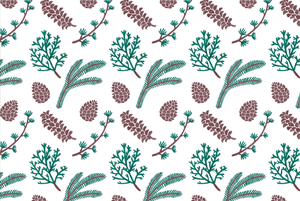 Inspired from kinds of pine tree branches and pine cones. Pines include conifer tree which can live until 100-1000 years. 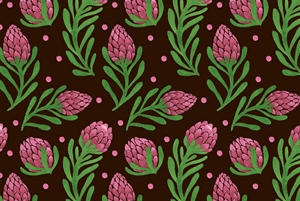 The Pine pattern is done with watercolor. 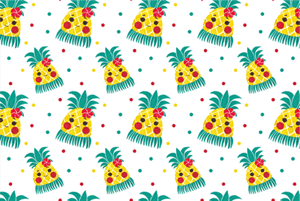 Inspired by hawaiian hula dancer costume and accessories while pineapple is identical as tropical fruit. Use bright color choice to show freshness and tropical athmosphere. La Fleur means "The Flowers" in French. 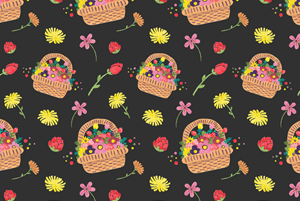 The fresh and colorful flowers in the basket is ready to welcome spring season. La Fleur Pattern is done with watercolor technique. 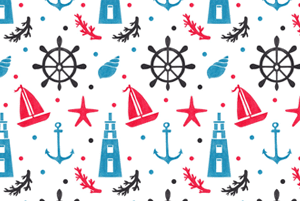 Sea Nautical Pattern depicts nautical stuff. The illustration is done with watercolor. 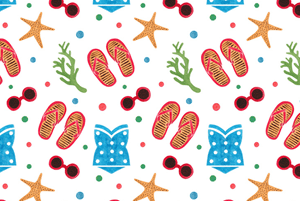 Summer Paradise pattern inspired by beach things, because summer is identical with beach. The sunglass and swimsuit illustration is inspired by 50’s pin up girl style. 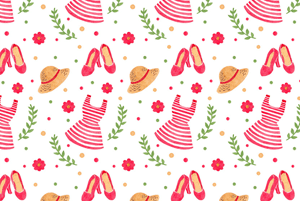 This pattern's inspired by 1950's dress with striped motif and hat. The illustration is done with watercolor. 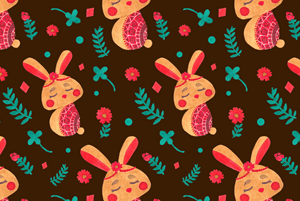 This pattern depicts ethnic easter bunny surrounded by flowers and leaves to show spring season. The pattern is done with watercolor. 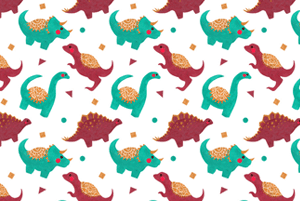 Inspired by some kinds of dinosaurs, like Tyrannosaurus, Stegosaurus, Brontosaurus and Triceratops and decorated with ethnic accessories on their back. Inspired by the beautiful and elegant black swan, decorated with flowers and plants. Use two colors choice, black and red to show the unique and elegant design. Welcome spring! The sakura flowers are blooming and its fragrance give happiness for people. The sakura pattern illustration is done with watercolor. 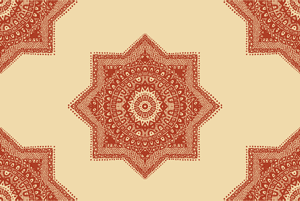 Inspired by middle east pattern motif style. The red colors and cream colors for background inspired by red mehndi decoration in woman hands. Inspired by the unique leaves in tropical jungle. 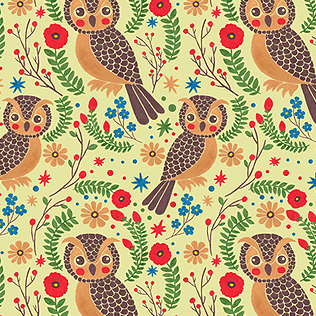 Bold and combination of red and green color in light background create fresh pattern design. 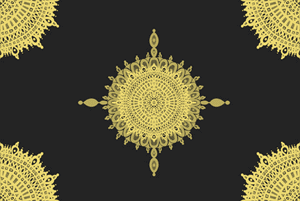 Golden sun doodle illustration in mandala style use gold and dark background to create luxury design. Fun and colorful ice cream made from fresh milk will bright your days. 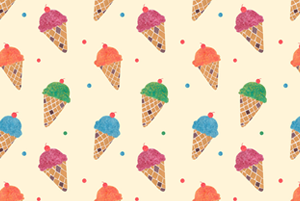 The ice cream pattern is done with watercolor. Suitable design for you who love feminine design and kids. 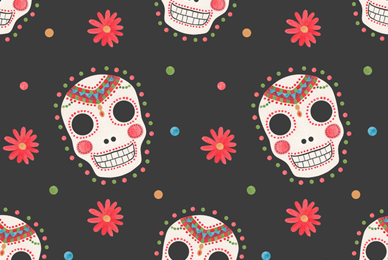 The sugar skull (calavera) represent human skull which made from sugar. It usually uses for the Mexican celebration of the Day of the Dead and the Roman Catholic holiday All Souls Day. Welcome to the jungle of Africa and let's start the adventure! Meet Mr. Lion, Mr. Giraffe and Mr. Crocodile. 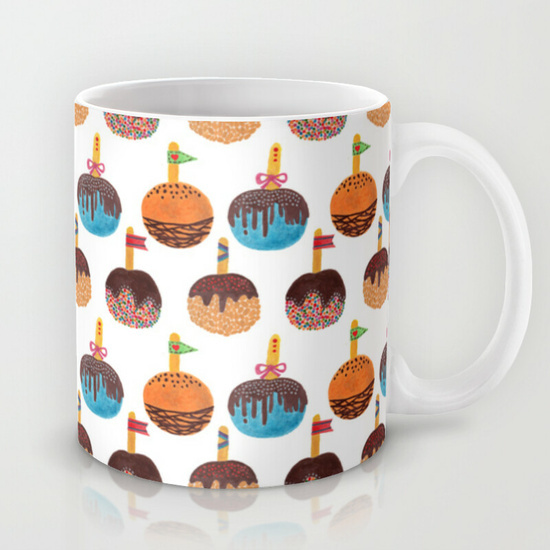 The pattern design is done with watercolor. Delicious breakfast food watercolor illustration. Fun and festive champagne pattern is done use watercolor. The tropical plant with colorful and big size plant. 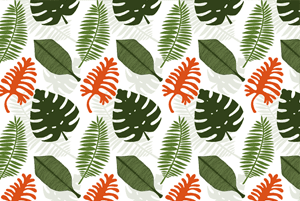 The pattern inspired by the beauty and festive colors of tropical plant. Inspired by the beauty inside the sea, the wonderful sea creatures and plants, the happy sea animal show the colorful and happiness. Sweet spring season in the garden. Flowers and leaves with fresh colors to show happiness celebrating spring season. 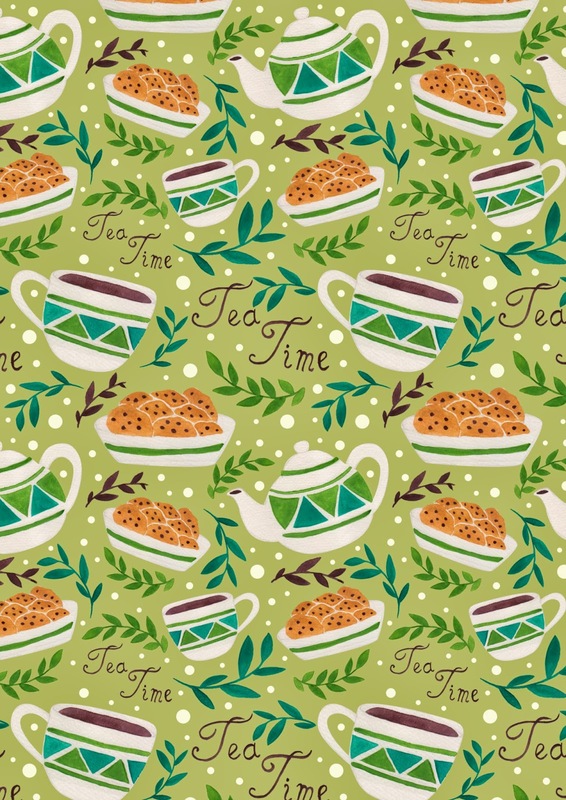 Tea time is one of British Empire Culture. 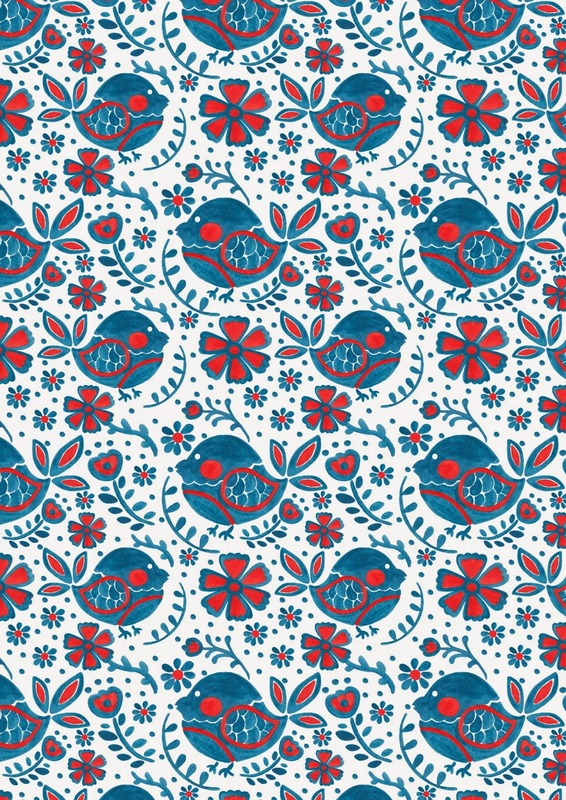 The blue bird print inspired by traditional Polish folk art motif. Music expresses that which cannot be put into words and that which cannot remain silent” (Victor Hugo). 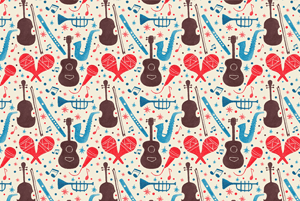 Music instruments pattern use retro color palette to make classical artwork style. The vintage flower pattern hortensia watercolor pattern. 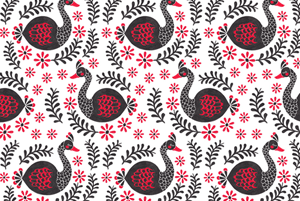 This pattern is inspired by tropical theme flora and beautiful scarlet ibis bird. 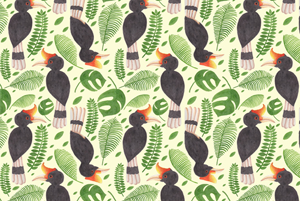 Beautiful tropical bird pattern inspired from tropical rainforest. The Inspiration of this pattern come from one of the hairless cat kind; sphynx cat. The fire lilies use 'the 'hot colors' gradation. The pattern is done with handdrawn watercolor. Khokhloma used for decoration of wood kitchenware. 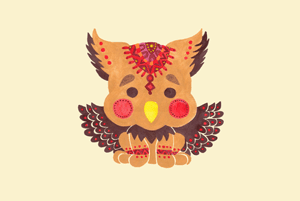 I'm interested with Russia folk art. This pattern is inspired by beautiful butterfly around the flower and the style of the pattern I inspired by the damask style pattern. 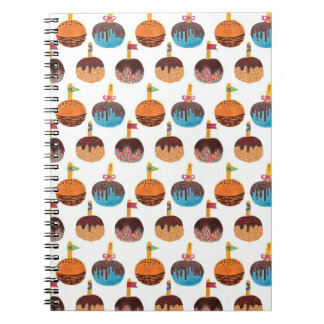 Colorful sea life pattern, inspired by colorful sea animals and corals. I do this pattern with watercolor. 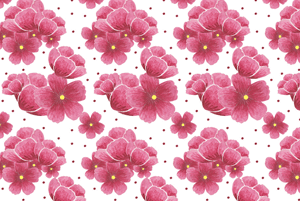 Scattered colorful flowers pattern is inspired by colorful tropical hibiscus flower. 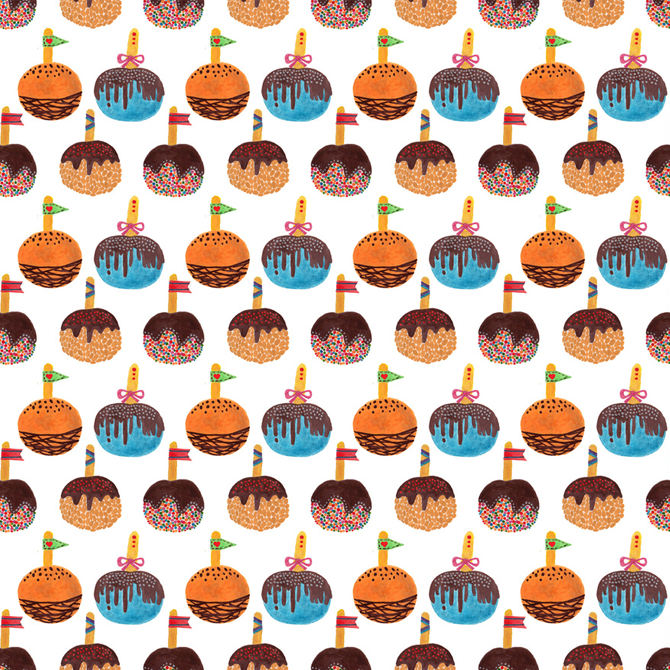 The pattern theme is autumn with autumn objects like dry leaves, pindecone, and acorn. Done with watercolor. Enjoy your autumn !! Gethuk is one of traditional snack from Central Java and East Java region, Indonesia.Made from cassava and it mixed with grated coconut, sugar and a bit of salt. Petits Fours is French appetizer. The words Petits Fours mean "small oven". It has three varieties : Glacé, Salé, Sec. This pattern is done with watercolor. 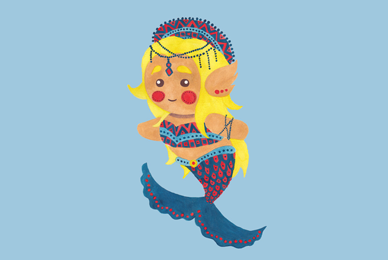 The mermaid princess always sings beautifully in the sea. She loves playing with her friends, sea creatures. This illustration is done with watercolor. Griffin, a mythological creature with the body, tail, and back legs of a lion; the head and wings of an eagle; and an eagle's talons as its front feet. Griffin symbolize divine power and a guardian of the divine. 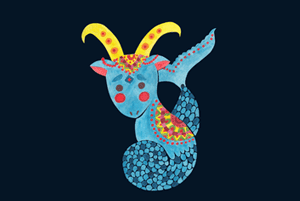 Capricorn is the tenth astrological sign which depicted with an animal half goat and half fish. People who have Capricorn zodiac were born in December 22th-January 20th. 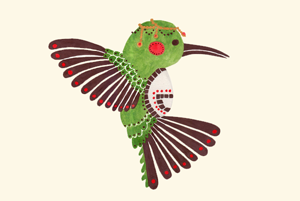 The cute little bird, green hummingbird which can fly 54 km/h backwards or upside down. It called hummingbird because the humming sound created by their beating wings. The sloth illustration is done with watercolor medium. Good night, sweet sloth. Legolas, the elf prince of Mirkwood fan art. Decorated with leaves to show the forest athmosphere in this artwork. Inspired by traditional Polynesian tribal mask. The illustration is done with watercolor. Inspired by the traditional ethnic mask of polynesian culture. The polynesian mask is done using watercolor medium. The illustration inspired by the sea turtle with traditional tribal Polynesian pattern. Represented by sea life of Polynesian Island. Spring is coming! The girl like play outside, around the flower in the garden and trees. Oppss.. The bird make the nest above her head. Thomas is a cute little tiger. He loves play in the jungle with his friends. He pretend as a king of the jungle like his father, with leaves crown and necklace. 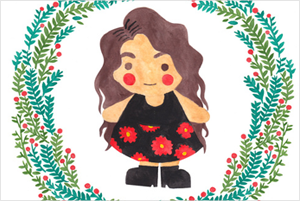 The kokeshi girl illustration represent a cute japanese little girl. The illustration use watercolor medium. Let’s groove in the space! The illustration is character fan art of Groot on Guardians of the Galaxy movie. Done with drawing pen. Matryoshka doll or Russian nesting doll is a set of wooden dolls of decreasing size placed one inside the other. The illustration is done with watercolor. This fantasy-look animal is really exist in real world! It has a long unique tusk like unicorn. The pattern is inspired by tribal motif. What a sweet relationship between sisters. 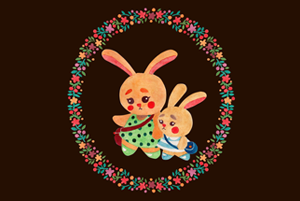 The bunny sisters walk together in sweet spring time, represented by flowers border and warm colors. This illustration is done with watercolor. In ancient egypt culture, cat (known as Mau) become sacred animal. Cat become symbol of grace and poise. Use two main colors to show the grace and luxury. The little wolf use a headdress inspired from traditional Russian woman headdress, kokoshnik that usually wear by woman in northern regions of Russia in the 16th to 19th centuries. Inspired by the beauty of bright flamingo's fur, the fabulous flamingo use pink calm and ethnic ornaments to show feminine and ethnicity atmosphere. Holiday winter season is coming! The Penguin was preparing his sweater and hot chocolate. Holiday winter season is coming! The Deer was preparing his sweater and hot chocolate. Holiday winter season is coming! The Rabbit was preparing his sweater and hot chocolate. Holiday winter season is coming! The Bear was preparing his sweater and hot chocolate. 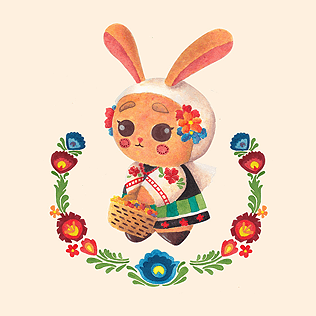 The polish bunny wear traditional clothes from Poland, the clothes inspired from the Leczyca area. The border ornaments is inspired from Polish plants traditional motifs. 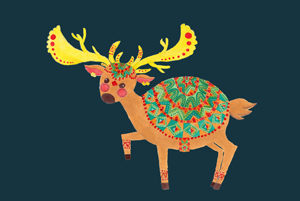 The ethnic deer is inspired by decorated christmas deer. The kind of deer which being the model is elk. The illustration is done with watercolor medium. 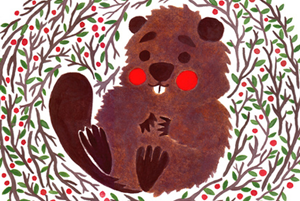 The Baby Beaver illustration is inspired by cute North American baby beaver. Beaver is a kind of rodent animal and it is active in night time (nocturnal animal) and also, they are not hibernate when winter. This artwork is dedicated for one of my favourite young talented singer, Lorde. Lorde is popular with her gothic style. In this artwork I show her in sweet vintage gothic style, vintage black flower dress and plant borders around her. I live in tropical country and start from this month until March we have rainy season. The girl in the rainy season is made inspired by the rainy season. Parrot is a one of intellegent animals, they can mimic human speech. Done this ilustration in illustrator. 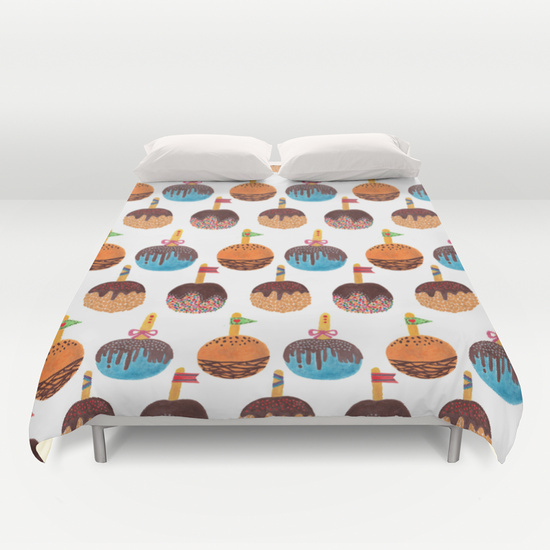 Suitable design for kids room decoration especially for girls. Toucan is a bird which has beautiful beak. Toucan can find in tropical and sub-tropical region. The illustration of Cendrawasih Bird is done with drawing and edited in photoshop and illustrator. Inspired by the beauty of Papua Nugini tropical forest and also the beautiful animals. 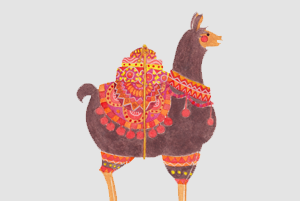 Llama is an animal from South America which usually use for consuming or packing. Llama can carry 25% to 30% of their body weight for 8–13 km (5–8 miles). This illustration is done with watercolor. 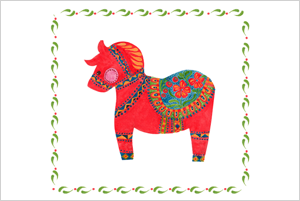 Dala Horse is a traditional wood toys from Province Dalarna, Sweden. In modern time, it is used for symbol of Sweden as general. 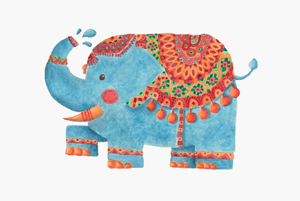 The blue elephant illustration is done with watercolor. The motifs details is inspired by tribal motif details. The horned owl illustration is done with watercolor. The motifs details is inspired by tribal motif details. The prince of fox watercolor illustration. The headdress is inspired by traditional headdress from Central Asia. It is done with watercolor. 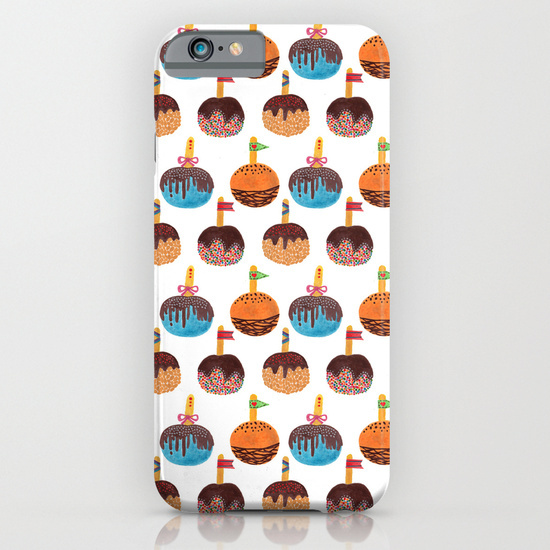 Suitable design for girls. Hi Miss Fox! 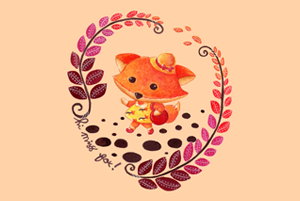 In the beautiful autumn morning, Miss Fox is ready to start her day with beautiful dress. This illustration is done with watercolor. 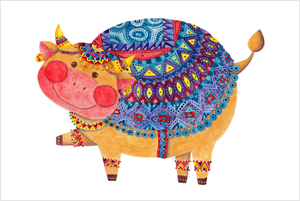 The Smile Cow Watercolor Illustration by Haidi Shabrina The cow is decorated with tribal motif details with cool blue colors. The smile cow illustration is done with watercolor. The big cat is done with watercolor. 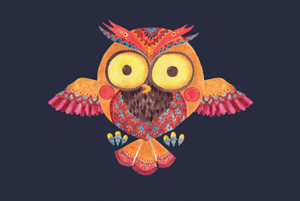 The details of its body is using tribal motif pattern. Suitable design for children or girls. 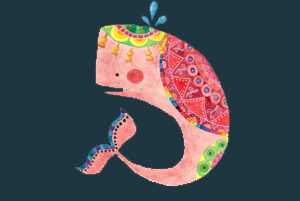 The pink whale is done with watercolor. The details of its body is using tribal motif pattern. The butterfly inspired by swallowtail butterfly and ethnic golden detail for the background. The ethnic golden detail depict ethnic jewelry and give luxury look for the illustration. 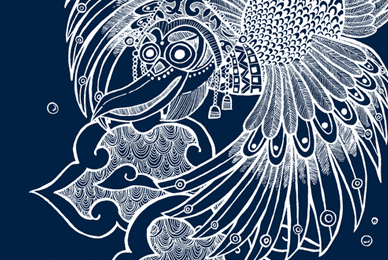 The Garuda drawing inspired the mythology bird, Garuda. Garuda is large bird like creature who appear in Hinduism and Buddhism. Garuda also known as vahana of Lord Vishnu. Garuda also adopted as Indonesia national symbol. Tipi (or also called tepee or teepee) is traditional conical tent which used by nomadic tribe of the Great Plains in North America. 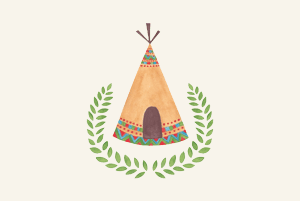 Traditional tipi usually made from animal skins, and wooden poles but modern tipi made by canvas. The white tree shine brightly in the cold and quiet night. Cold in winter night. Done with drawing style. Beautiful jewel inside the forest. She has beautiful elk horn and ear. Her beauty is completed with leaf crown. Done with drawing pen. This illustration inspired by beautiful daisy and peony flowers with elegant vintage style. The turban girl silhouette illustration inspired from beautiful ethnic african women who wear turban. 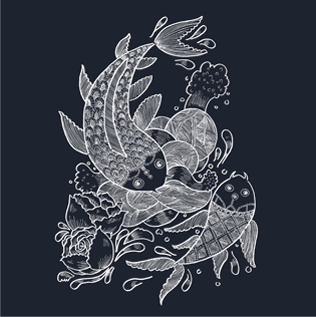 The illustration of two koi fishes is inspired by japanese-style illustration especially for the details. Koi fish looks beautiful with graceful movement look from above. Night comes, but the butterfly still fly in the moonlight. 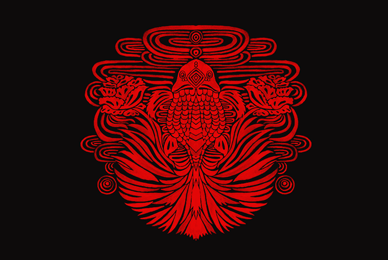 The red goldfish artwork is inspired by chinese paper cutting craft. The red color in chinese culture mean good luck. 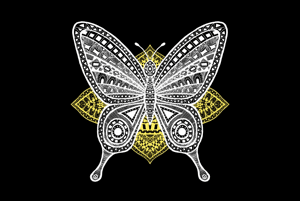 The butterfly in russian khokhloma style pattern. Done with watercolor. Mix of two cultures, khokhloma (russia) and the day of the dead (mexico). The illustration is done with watercolor medium. 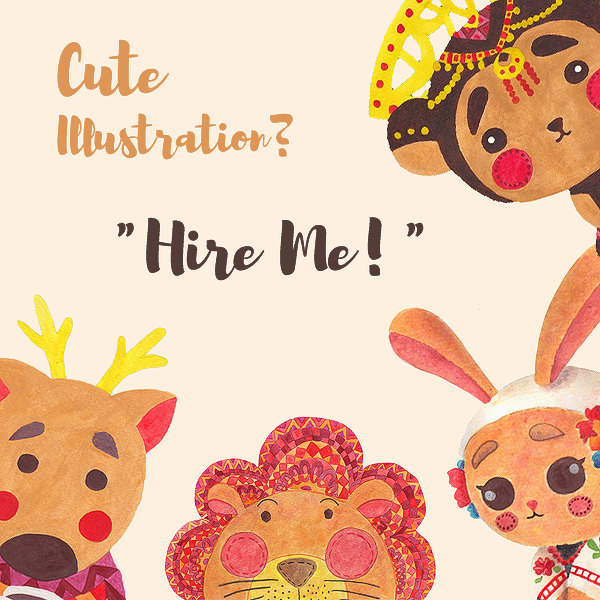 This illustration inspired by classic fairy tale from Grimm Brothers : The Red Ridding Hood. I emphasize the red hood with red color to make the point of interest. 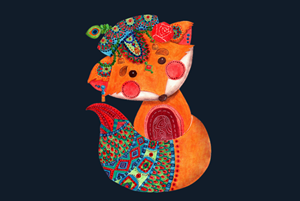 This illustration inspired by classic fairy tale from Grimm Brothers : The Fox and the Cat. © 2015 by Haidi Shabrina. All other trademarks and logos belong to their respective owners. 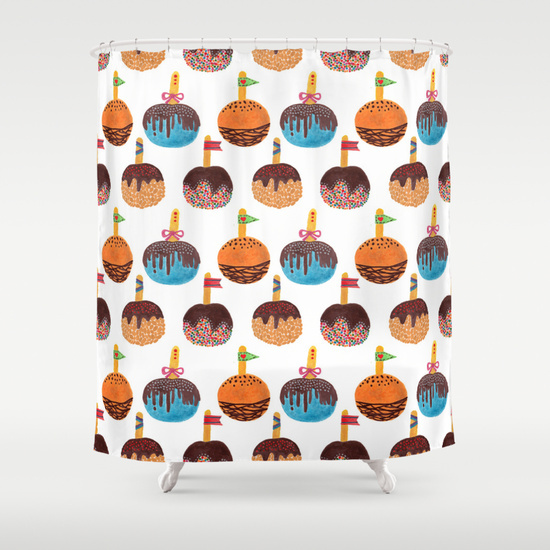 Preview images are taken from Society6 and Zazzle. Copyright by Haidi Shabrina 2015. Powered by Blogger.